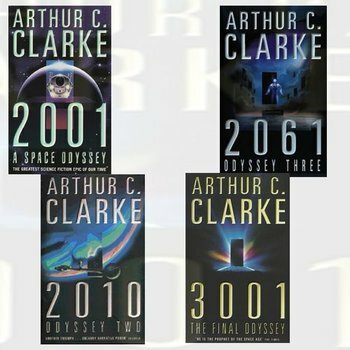 The Space Odyssey Series is a series of novels written by Arthur C. Clarke, which takes a philosophical look at many Speculative Fiction Tropes, such as Precursors, Intelligent Computers, space travel and the humankind's place in the universe. 2001: A Space Odyssey (1968): A interesting case since the novel is actually the byproduct to a collaboration between Clarke and Stanley Kubrick, which resulted in the film of the same name that came out the same year, which makes the book the Novelization (Clarke himself said the book should have been credited to "Clarke and Kubrick", just like the movie was credited to "Kubrick and Clarke"). The book and the film are both based on some of Clarke's earlier short stories, most prominently The Sentinel, and they largely follow the same plot, but with some small differences. A strange Monolith is discovered on the moon, apparently having been left there by a race of extra-terrestrial lifeforms. As it is being studied by human scientists, it sends some kind of transmission into outer space. About a year later a crew of five astronauts leaves for a scientific exploration travel to Saturn on the space-ship Discovery. Only two of them, David "Dave" Bowman and Francis "Frank" Poole, are left awake to help the sixth crew member, a supercomputer by the name of HAL 9000, with monitoring the ship's day-to-day function. This is just boring routine, until HAL starts acting weird and unpredictable, not only jeopardizing the mission, but also the life of the crew. 2010: Odyssey Two (1982): While not initially thought up by Clarke as a movie idea, the book was, in 1984, adapted, with his and Kubrick's blessing, into the film 2010: The Year We Make Contact. Nine years after the Discovery's travel to Jupiter (changed from Saturn to match the film), a joint Soviet-American crew is heading for the mighty gas-planet to find out what happened to the Discovery and its crew. Meanwhile David Bowman, now reborn as a Energy Being, is helping the race that created the Monoliths with scouting Jupiter and its moons for primitive lifeforms, hopefully finding one that has potential to turn sentient. 2061: Odyssey Three (1987): Heywood Floyd, one of the main characters from the previous novels, has been invited as a celebrity guest for the spaceliner Universe's landing on Halley's Comet. Meanwhile a militant anti-Afrikaner takes control of the shuttle Galaxy, which she crashes into Jupiter's moon, Europa, leaving Universe as the crew of the Galaxy's only hope of rescue. 3001: The Final Odyssey (1997): The Discovery crew member, Frank Poole, having been killed by HAL 9000 and left adrift in space for a thousand years, is brought back to life through the wonders of future science, and begins to explore the earth of 3001. Meanwhile, the creators of the Monoliths are making their final speculation about whether or not to sacrifice human kind for the greater good. Absent Aliens: Besides the unseen creators of the Monoliths, the Europans and Jovians, mankind has not made any contact with other aliens even by the year 3001. Amicably Divorced: Poole's relationship and eventual marriage with Indra is a form of this. They even managed to stay friends after the split up romantically 15 years later. Artistic License  Biology: Nicely averted when a Europan life form eats a human, and then vomits it back up, pointing out that alien predators wouldn't necessarily find us tasty or nutritious, and that our biochemistry could even be poisonous. Ascend to a Higher Plane of Existence: "The creators of the Monoliths", David Bowman, HAL 9000. Back from the Dead: Frank Poole, whose body was found essentially by chance, gets resurrected about a thousand years in the future by the advanced medical techniques. While he's something of a curiosity and living relic, his life is uneventful enough that he goes on to once again become a civilian. Broad Strokes/Negative Continuity: While all of the novels takes pretty much all of the events of the previous ones in account, each installment also seems to ignore the ending of the previous one. invoked Word of God is that each novel takes place in its own parallel universe. In his notes on 2010, Clarke notes that the novel is in many ways more a sequel to the movie. In particular, it relocates the action of 2001 from Saturn's orbit to Jupiter's (as the film did). Canon Immigrant: Mister Machine (now Machine Man in the Marvel Universe). Circumcision Angst: Inverted. A woman loses interest in Frank because his is circumcised, something that isn't done in 3001. Subverted by Frank, who is bemused to learn why his one-night stand ran out on him, but declines restorative surgery and goes on to date more favourably inclined women instead. The Day of Reckoning: The last page of 3001 makes a statement that the Monolith's makers will not determine humanity's fate until "the Last Days". Earth-Shattering Kaboom: In 3001, the people observe a planet explode, which somehow triggered a supernova. They are left to wonder if there was intelligence on that planet and if they caused the supernova. Though everyone was so terrified of the phenomenon they didn't want to speak of it again. Everything's Better with Dinosaurs: In 3001, humans are able to clone raptors who are used for labor, and excellent babysitters. They tried using great apes (like gorillas), but as Frank learned, the apes "don't have the patience for it". Setup - Would you trust your children with a dinosaur? Punchline - What? And risk injuring it? Endless Daytime: Europa in 2010, thanks to Jupiter becoming a star. Faster-Than-Light Travel: In the first book, it's shown that one of the monolith's functions is to work as a stargate. Bowman also learns how to travel faster than light on his own after being transformed by the monolith, despite knowing it's supposed to be impossible. Later books drop this. The Great Politics Mess-Up: In addition to incorrectly predicting that the USSR would still exist by the year 2061, the series also incorrectly predicted that the South African Apartheid regime would end in a coup d'état, with the white population fleeing and taking most of the country's wealth with them, leaving the black population to rebuild the economy, which they are able to do so in a matter of months. Halfway Plot Switch: 3001 is about a man brought back to life 1,000 years in the future and Clarke's thoughts on what it will be like, then only the last third returns to the ongoing plot of the series. Kill All Humans: In 3001, it turns out the monoliths have decided that humanity is no longer worthy of existence, due to how we behaved during the 20th century, and blocks out the Sun (and Lucifer) in an effort to kill us all. Living Gasbag: 2010: The Year We Make Contact had the noncorporeal Bowman journeying down through the Jovian atmosphere, where he sees gigantic non-sentient living beings in various geometric shapes floating through the clouds and consuming similar smaller creatures. They are all killed when Jupiter is turned into a star. More than Three Dimensions: The first novel explicates that the Monolith has sides in a proportion of 1:4:9, the squares of the first three integers. Then it suggests the Monolith extends in more dimensions, presumably by squares. "And how naive to have imagined that the series ended at this point, in only three dimensions!" Oh My Gods! : In place of "God", the people of 3001 say "Deus", example: "By Deus - It's full of stars!". Outgrown Such Silly Superstitions: By the year 3001, religion is abolished. That said, they aren't entirely disbelievers: they are generally either "Deists", believing in not more than one god, or "Theists", believing in not less than one god. What this God (or possibly gods) has to say about anything is eminently unclear, however. Precursors: The mysterious race only know as "The creators of the Monoliths". The prologue gave them the name "Firstborn", but was never used in-story. Rip Van Winkle: Frank Poole, by dint of coming back from the dead after a thousand years. Sudden Sequel Death Syndrome: 2061 mentions that Dr. Chandra died in hibernation on the trip back to Earth after 2010. It's implied that he died of grief over HAL having been destroyed by the explosion of Jupiter. Terraform: 2061 and 3001 depicts humankind as being capable of this. You Keep Using That Word: In-Universe, mixed with Nonindicative Name. The monolith near Jupiter is designated TMA-2. This is in spite of the fact that TMA stands for Tycho Magnetic Anomaly, referring to the original monolith on the moon (which stopped being magnetic after it realized it had been dug up). The crew of the Leonov snarkily refuse to use the term. Happens later on when Moonwatcher's monolith is dug up and termed TMA-0.